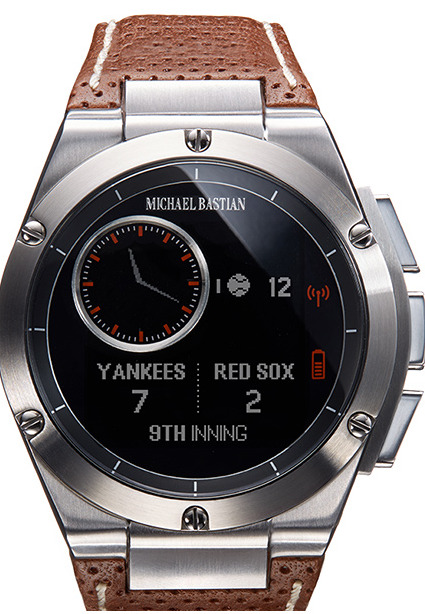 HP and Michael Bastian have finally revealed more information about their forthcoming smartwatch, the Chronowing, and The Wall Street Journal got an early look at it. It will go on sale Nov. 7. Bastian told the Journal that his watch is meant to be more of an accessory than a piece of technology. It’s not quite as advanced as other wearables — it can’t track your steps or allow you to make phone calls — but that’s because it’s meant to discreetly show your notifications at a glance. You’ll control the watch using buttons along the side of the watch rather than a touchscreen, as we initially reported back in August. The Chronowing will be exclusively sold through Gilt.com, and it costs $US349. There’s also a limited edition with sapphire crystal and an alligator strap that will sell for $US649. The battery is expected to last for seven days on a single charge, and you’ll be able to switch up its watchfaces, control music playing on your phone, and view incoming texts. The Chronowing is one of few wearables that are trying to win over consumers by being marketed as a high-end luxury watch rather than a gadget. The MICA smart bracelet, a collaborative effort between Intel and Opening Ceremony, comes covered in gems and looks like a piece of jewelry. Disclosure: Kevin Ryan and Dwight Merriman, the founders of Gilt Groupe, are investors in Business Insider.